LAST year we wrote about BlueCoat’s relationship with the EPO. Some people already know about this, but some do not. BlueCoat is (or at least was) used to spy on EPO staff and censor EPO staff, as we first suspected quite a while back (this was later confirmed to us). 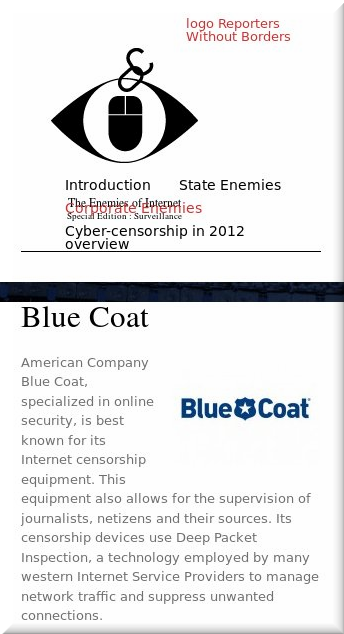 We gave some background regarding BlueCoat at the time. It’s militarised, just like Control Risks. There are many militaristic elements to the EPO under Battistelli and it’s getting worse over time, to the point where one paranoid man in a suit has half a dozen bodyguards, costing a fortune. “There are many militaristic elements to the EPO under Battistelli and it’s getting worse over time, to the point where one paranoid man in a suit has half a dozen bodyguards, costing a fortune.”“Please spread this really bad news which I read on Twitter,” wrote to us one person earlier today. It’s a reliable source. “BlueCoat is used by the EPO to filter web traffic (at least it was in 2013/2014),” our source told us. This is something that we were able to verify independently. “From now on all these people (bastards) can intercept (as Man-in-the-middle, MitM) and read (possibly) without that you even notice also https:// traffic because your browser will trust them, because they have a real unrestricted certificate -like your bank, and so on.Please spread this really bad news.